UNITED NATIONS, January 28 -- "China does not have diplomatic relations with Haiti," a senior Chinese diplomat confirmed to Inner City Press over spicy shredded chicken Thursday night at the Chinese Mission to the UN. The reason is that Haiti still recognizes Taiwan. "But we search our search and rescue," the diplomat continued. 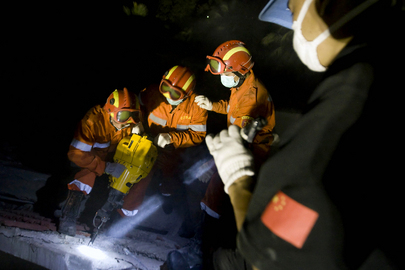 Inner City Press informed him that the UN, earlier this week, told the Press that the Chinese search and rescue team, after digging out Chinese casualties under the Christopher Hotel, "returned to Beijing." "That's just a rumor," the diplomat protested, adding the UN humanitarian chief "John Holmes denied that." But UN Haiti spokesman David Winhurst said that it was true, the Chinese "returned to Beijing." "We don't care that they think," another Chinese diplomat told Inner City Press. Inner City Press had suggested that whoever becomes the next Chinese Ambassador to the UN make more of an effort of stating the country's position at the stakeout, as for example both the French and American Ambassadors have done in recent days. The diplomat shrugged. "If you want clarifications or facts, you can call us. But we don't care what they think." About the International Monetary Fund requiring a reduction in size of the "Chinese" deal with the Democratic Republic of the Congo, the Chinese diplomat scoffed that it was a deal not by the Chinese government, but "companies." He said of the Joseph Kabila government, "They are sitting on riches but don't have the money to dig them out. We provide that, and the give us minerals, like copper." He added that the Chinese deal with Guinea, right after the 2009 massacre, was by a Hong Kong based company. At the Chinese end of Security Council presidency reception on Thursday night, the Permanent Representatives of such Council members as Russia, the UK, Brazil, Mexico and Austria milled around with the Sudanese counterpart. The US was represented by Deputy Alejandro Wolff. General Assembly President Ali Treki, with bodyguard, put in an appearance. There was Moutai -- cut off when one reporter got too boisterous -- and blackened pepper steak. "We don't care what they think," the diplomat had said -- but this did not appear to apply to, or undermine, the Mission's hospitality. But African resource deals? Watch this site. UNITED NATIONS, January 27 -- UN peacekeepers have been firing tear gas and, according to eye witnesses, rubber bullets at Haitian aid seekers. 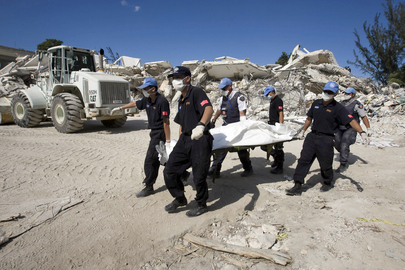 Meanwhile, the UN confirmed on Wednesday that the Chinese search and rescue team which appeared so quickly in Haiti left just as quickly, as soon as it recovered the bodies of its own national who had been visiting the UN Mission, MINUSTAH. Inner City Press asked MINUSTAH's David Wimhurst about the use of rubber bullets and tear gas, which Wimhurst previously said he had not witnessed in Cite Soleil on January 24. Wednesday, Wimhurst counted the Cite Soleil "incident" as one of two uses of tear gas. He said the use by the UN is under "strict rules and regulations" that are "well established." Video here, from Minute 32:31. Wimhurst said he is "not aware of rubber bullets" being used, despite numerous eye witness accounts of both Uruguayan and Brazilian UN peacekeepers firing into the air. Inner City Press asked about similar reports of peacekeepers leaving behind food and in one case a pile of radios, which were then fought over. Wimhust said he was "not aware of [these] being left behind," adding that battalions take their equipment with them. But these are transistor radios. Inner City Press asked him to confirm that the UN was paying $94,000 a month for the Christopher Hotel, now collapsed. "The number you mention is probably close to the amount," Wimhurst replied, saying that Security informs him the Hotel was MOSS compliant. Video here, from Minute 12:15. We'll see. Wimhurst remained silent when asked to explicitly confirm that the Chinese search and rescue team left immediately after digging out its own national. But when asked twice to name a single other place in Haiti where the Chinese team had dug, he could not. "They went back to China," he said. Video here, from Minute 10:02. China is this month's UN Security Council President. We will be pursuing this. Watch this site. Footnote: The UN's noon briefing on Wednesday, 15 days after the Haiti earthquake, was limited to a video link to MINUSTAH, with no other UN questions taken on any other topic. Some said that Spokesman Martin Nesirky was still busy from having accompanied Ban Ki-moon into the Security Council earlier on Wednesday. But his Office has other staffers. While Ban Ki-moon is slated for a stakeout on Wednesday afternoon, it is doubtful that many questions can be asked. To some, this appears to be an attempt by the UN to manipulate the press, to remain "on message," on Haiti and Ban's Wednesday announcement, about Afghanistan. What about Sudan? Somalia? Sri Lanka? Corruption? Watch this site.